Nasal congestion does not look age, adults, children and even babies can experience it. Clogged nose makes the discomfort and difficulty breathing especially in infants. Therefore, know how to cope with nasal congestion in infants. A blocked nose can occur on one side or even on both sides of the nose. 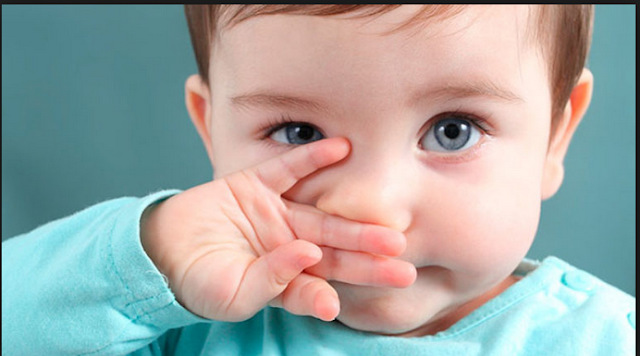 Before discussing about how to cope with the nasal congestion in infants, then we must first know the cause. One of the most common causes is flu or cold, especially in infants. Allergic Rhinitis, can occur either because of allergies or not allergic to something different foreign. Allergy is a reaction of the immune system in the body when there are incoming foreign bodies, such as dust, food or anything else. Vasomotor rhinitis, is an inflammation of the nasal mucosa, one of which is caused by extreme weather changes. Usually marked by a snot or sneeze. Polyps, tissue growth in the nasal passages. Tumors, can block the respiratory tract, causing nasal congestion. Mother can bring a container of hot water to the baby, be careful that baby's hand does not reach for a container of hot water. Mother can also mix telon oil on water or other aroma therapy. Mother can position the baby in her lap, with the head lower than the baby's body. Then let the baby breathe in hot steam. Some argue this way is actually no longer recommended, as it can cause the baby to burn. But still safe if carefully do it. If the baby does not like the steam method, Mother can use telon oil that is close to the baby's nostrils for the baby to breathe. Mother can also use an inhaler to overcome stuffy nose in infants. Turn off the use of air conditioning, fan, and use that can make the room and baby's body temperature cool. By making a baby warm can help overcome his clogged nose. Mother can also provide steam in the bathroom, by putting hot water in the tub for the room was warm. If one of the causes of nasal congestion in infants is vasomotor rhinitis (blood vessels in the sensitive nose) when the baby sleeps, keep the baby's head upward. With sloping sleep can cause a clogged nose to move to one part of the nasal cavity. Another way to position the baby's head is higher, namely by raising the crib bed. When dropped on the baby's nose, Mother can hold the baby or set the baby position in a flat place. Drop into baby's nose, then wait 5 minutes after dripping solution. When using saline solution by spraying, position the baby in a state of sleep. Lift the baby's head slowly, if trouble because the child moves Mother can ask the help of people who are at home. spray 1 or 2 times into two baby nostrils in turn. Maintain the baby's position for 5 minutes after being sprayed. Note: frequent use of saline solution may cause nasal irritation. At the age of under two years, balsam or oil applied to the nose may be swallowed when his hands reach for it, then insert a finger into the mouth. or it could be olesan oil can flow into the mouth. Instead of wanting to cope with a stuffy nose in a baby, smearing oil or balsam on the nose can even make the baby feel burning or spicy. Before inserting the rubber ball tip into the nose, press the rubber ball first. If pressing the rubber ball while inside the nostrils, can make more mucus come in again. insert the rubber ball into the baby's nose while pointing the baby's head to the side. Then after the rubber tip out of the nose, remove the sucked liquid by releasing pressure on the rubber ball. Note: wash dee lee every time the use and steamed dee lee to keep it clean. Nasal congestion with fever over 38 degrees Celsius. Pain in the ear or baby becomes fussy as usual. Nasal congestion with difficulty breathing. Nasal congestion with cough (bleeding or dry). there is swelling of the forehead, eyes, both sides of the nose, or cheeks. If the baby's nose comes out the liquid other than the color other than yellow and white and the smell is not delicious. Nasal congestion that does not heal.